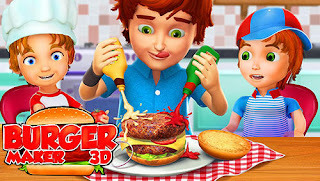 Cook the most amazing and exciting burgers with the best toppings and flavours and toss it into your master delighting food and serve it. Choose from a variety of toppings, salads, patties, sauces, meat, cheese, and vegetables and transform your burger skills into a sizzling burger. Choose your hamburger meat and grind it up. 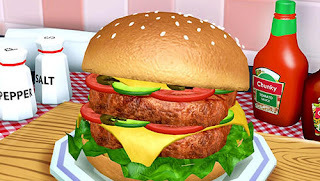 Then add spices and special ingredients to flavor your patty, make your juicy Burgers with special ingredients including Chicken, beef, mutton, fish, Sauce, Cream, Bacon, Onions, Mushrooms, and cheese. Now it’s time to flip & fry your hamburger patty, but be careful not to burn the burger! Start your day in the kitchen where all food ingredients are placed on the shelf. Experience the true maker & baker environment with real chef. In a large bowl you have to add water, flour, yeast, eggs, olive oil, milk. Mix it well add salt and mix it again.